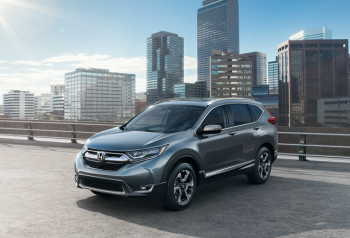 With the upcoming release of the 2017 Honda CR-V, many of our Goshen and Monroe customers are itching to learn more about the changes that have been from the previous year. The 2017 Honda CR-V redesign is much more than a mid-cycle refresh — it will offer more power, a larger cabin, and more standard features than previous models. Keep reading to learn more about the redesign of the 2017 CR-V.
From first glance, you’ll notice a considerable difference between the 2017 Honda CR-V and previous models because of its updated aggressive stylized headlights surrounded by a wing-shaped LED DRL array and wide, burly fenders. The CR-V also has a more sophisticated presence thanks to its long hood, longer wheelbase, short rear overhang, and dual exhausts. You’ll also find a Honda-first Active Shutter Grille that lowers aerodynamic drag, new aluminum alloy wheels, and narrower A-pillars for enhanced visibility. For 2017, the CR-V receives its first-ever turbocharged engine, and it’s more powerful and more fuel-efficient than previous engines offered with the CR-V. The 1.5L turbo 4-cylinder engine can produce up to 190 hp, and we expect its mpg ratings to be stunning. This engine will be paired with a continuously variable transmission (CVT) with Honda G-Shift control logic. Previous CR-V models had plenty of comfort and convenience features to make even the shortest of trips across Goshen go by in the blink of an eye, but now the 2017 Honda CR-V offers even more. You’ll not only find incredible interior space and ample rear legroom, but you’ll also find new available features, including remote engine start, dual-zone climate controls, heated side mirrors, an Electric Parking Brake (EPB), and rear USB charging ports. The Honda Sensing Suite of driver-assistance technologies also becomes standard on EX trims and higher. Goshen and Monroe customers can learn about all of the changes that have been made to the 2017 Honda CR-V at Middletown Honda. We can tell you all about the new CR-V redesign and discuss availability. Stop by soon to learn more or contact us online with any further questions.